Every outdoor space can be made more attractive with the addition of plants, but not every landscape has yard space for garden beds. A great solution for small yards and for decks and patios is to build a planter box or two. A large planter box measuring 24 inches wide, 48 inches long, and 24 inches deep can hold plenty of potting soil to grow almost anything you want—even small shrubs. If you build several, you can create an attractive border or privacy screen for a patio or other outdoor seating area. Our project is built from simple 3/4-inch-thick plywood, but it is assembled with joinery biscuits, a type of woodworking joint that allows for hidden joints and no visible hardware. If you don't own a biscuit joiner, the joints could also be secured with screws or metal connectors. This planter box is dressed up with trim moldings that give the project a frame-and-panel appearance, and it has a plastic liner and drain fitting that prevent water damage to the wood. End pieces: Biscuit slots are cut into the edges of the plywood along the bottom and both side edges. Bottom piece: Biscuit slots are cut into the edges of the plywood sides but into the face of the end pieces. Using a biscuit joiner, cut the biscuit slots at the marks. Cut slots for either #10 or #20 biscuits. The basic box (carcass) of the planter is assembled with wood glue and biscuits. Apply a small amount of wood glue to the bottom slots of each end piece, and insert biscuits into the slots. Add a bit of glue to the corresponding slots of the bottom piece, and fit the end pieces onto the bottom piece. Tap the piece together so the joints are snug. Tip the unit on its side and drive some finish nails (preferably using a pneumatic finish nailer) through the plywood bottom and into the end pieces. Add glue and biscuits to one of the side pieces, and glue the corresponding slots in the edges of the assembly that are facing upward. Fit the side onto the assembly, aligning all of the biscuits with the slots. Tap the side piece into place, then tack it with finish nails. Flip the assembly over and install the remaining side piece using the same techniques. Rip four 8-foot 1 x 4s in half so the two long pieces are approximately 1 3/4 inches wide. Rip two 8-foot 1 x 4s into two strips, each 2 1/4 inches wide. Assemble the four 2 x 2s to form a 24 x 48-inch frame, using 2 1/2-inch wood screws. Attach the frame to the bottom of the plywood box using glue and 2-inch screws, driving the screws through the bottom of the box and into the frame. Next, you will install bottom and top trim for the planter box. The ends of the trim pieces will be mitered. Using a miter saw, cut full-width 1 x 4 trim along the bottom of the box so the wide face of the trim is flat against the plywood. Attach these trim pieces with glue and finish nails. Cut and attach 1 3/4-inch-wide trim pieces along the top of the box, so the edges of the trim are flush with the top of the box. Again, the ends of the trim pieces should be mitered. Trim the top edges of the box with the 2 1/4-inch-wide pieces, mitering the ends and placing the trim facedown on the top of the box, flush with the outside with the 1 3/4-inch top trim. Cut 1 x 1-inch outside corner molding pieces to fit vertically between the bottom 1 x 4 trim and the top trim. Attach the trim at each of the four corners with glue and finish nails to cover the exposed plywood edges of the corners. 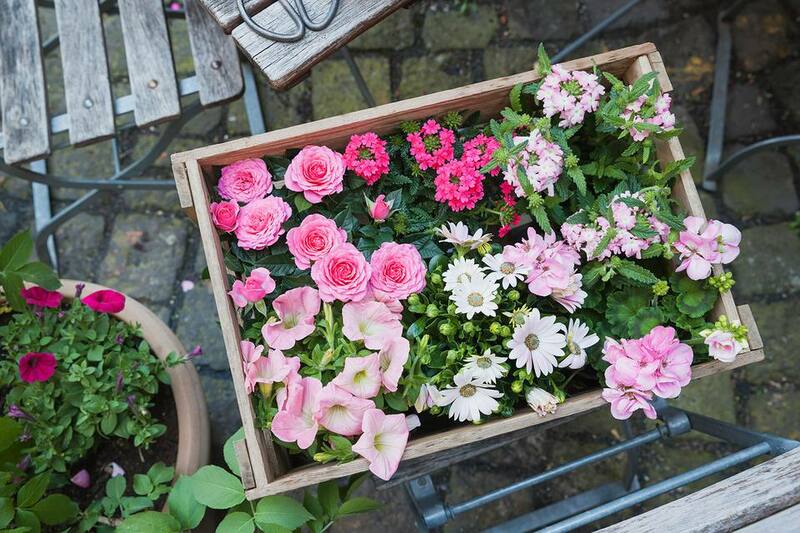 Your planter box can be stained or painted according to your preferences. Choose a good quality outside finish or paint to ensure long life for your planter. Fill any nail holes or blemishes with wood filler and let dry. Sand the entire box, making sure any patched areas are sanded flush. Focus your sanding on the trim boards, making sure that any rough edges or faces are addressed. Stain or paint your planter box as desired. If you use stain, you will also need to apply an exterior polyurethane, applied as directed by the manufacturer. If you are painting, first caulk all of the joints and exposed gaps to help waterproof the box. Apply two coats of quality primer to the entire unit, and follow with a few coats of paint. Let the final coat of finish cure for at least 24 hours, or as directed. Line the interior of the box with a single piece of 6-mil plastic sheeting measuring 6 by 10 feet. Start by centering the plastic over the top of the box, then tack one edge of the plastic along one side with staples running along the top, just under the top trim. Push the plastic down into the box to cover the side, bottom, and opposite side. Staple the plastic into place along the top edge on the opposite side. To attach the ends, fold over the plastic that bunches at the corner against the end (much like folding square corners when making a bed), and tack the flattened fold against the top of the box. Fold the opposite corner against the end of the box, and staple it in place. Repeat with the opposite side. Trim off any excess plastic with a sharp utility knife. Be careful not to puncture the plastic when installing it, or water may seep through the plastic and possibly damage the wood of the planter box. Cut a 6-inch piece of 1/2-inch PVC conduit to 3 inches long. Screw a 1/2-inch threaded PVC male terminal adapter into the threaded opening on the lampholder cover from the back side. Use solvent glue to attach the 3-inch-long piece of PVC conduit into the socket on the male terminal adapter now attached to the lampholder cover. Drill a 7/8-inch hole through the side of the plywood box at the desired height for the drain. Cut the same diameter hole through the 6-mil plastic. The lampholder cover should include a rubber gasket, but do not rely on the gasket alone. Apply a healthy bead of silicone caulk around the perimeter on both sides of the gasket, then push the conduit through the hole in the center of the gasket and finally through the hole in the plastic liner and plywood box, from inside the box. Screw the lampholder cover into place inside the planter with 3/4-inch wood screws. The attached conduit will extend through the wall of the planter. On the outside of the box, solvent-glue a 90-degree PVC elbow to the end of the conduit so the bend faces downward. If desired, paint the drain parts to help hide them on the outside. 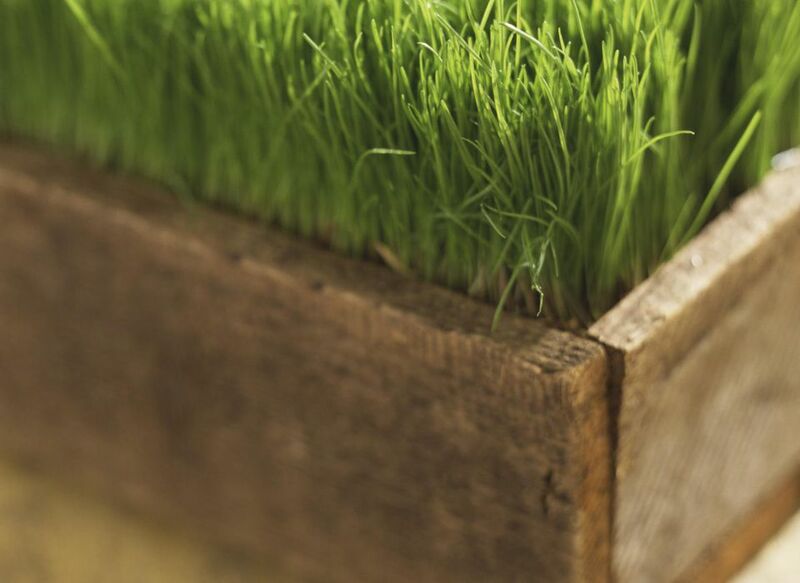 Install 1 3/4-inch trim around the top inside edge of the planter box to cover the staples that hold the liner in place. Fill the nail holes and apply paint (or stain and polyurethane), if desired. Tip: It is a good idea to paint or stain these trim pieces before you cut and install them. They'll need a bit of touch-up after installation, but it is much easier to finish them before they are installed.